A dental crown is a full-coverage restoration of a tooth. It is required if a tooth has a crack or has lost a large amount of tooth structure due to a large cavity, a root canal procedure, or dental trauma. In effect, a crown becomes the new outer surface of the tooth, giving it strength, stability, and improved aesthetics. Drs. Bruce and Alex Roach and Dr. Travis Haddad use a number of different materials for crowns, including all-white crowns, gold crowns, or all-metal crowns. White crowns are most popular due to their color and translucency, making them a more aesthetic option. Harder metal crowns are used more for back teeth that experience higher forces when chewing. Not all patients are best off with the same crown material, so we’ll work with you to achieve the best overall result for your crown procedure. First, Drs. Roach or Haddad will numb the tooth and area surrounding where the crown is to be placed. 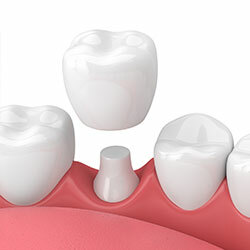 The tooth will be prepared by removing a little bit of tooth structure on all sides of the visible tooth. This will create enough room for the new crown to fit with the surrounding teeth. An impression or mold of the prepared tooth is made and a temporary crown is placed. You’ll need to return to our Waterford dental office in two weeks, when the temporary crown will be removed and the permanent crown is cemented into place. Take care of your new crown the same way you care for the rest of your teeth: with consistent brushing and flossing and regular visits to our Waterford dental office for professional cleanings and exams.